The bathroom is the sanctuary of a home, a place for you to relax after a long day out. So it makes perfect sense to invest in the design of this part of the home, ensuring that it not only feels luxurious, but also light and airy. A simple way to create a sanctuary in your bathroom is to go for a minimalist design. In this bathroom in a Guangzhou house, a spacious layout is complemented with a simple palette of shades of white, cream, grey and brown, which allows luxurious materials like marble to shine. As such, the design is luxurious yet not overpowering, creating a clean and airy look for a tranquil mood. 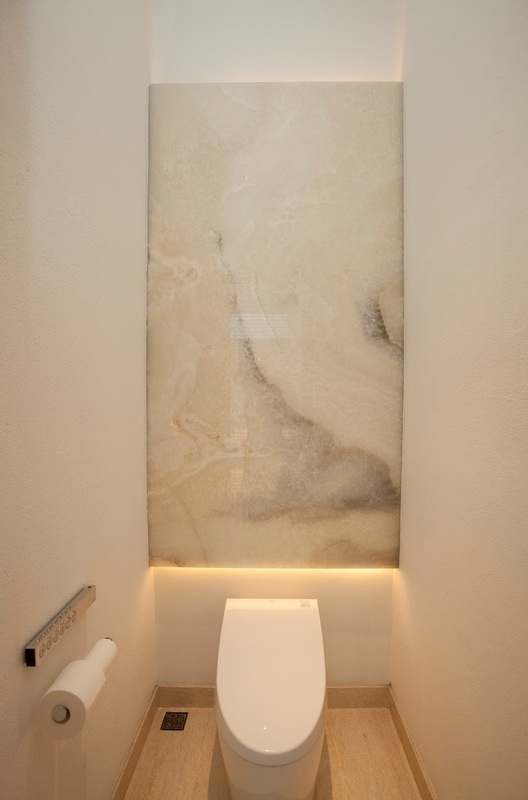 The toilet bowl might not be the most aesthetic, but you can enhance its look by using a beautiful piece of marble to create a feature wall behind the toilet bowl. 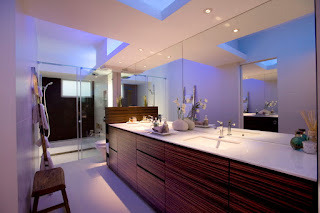 Lighting also plays an important role in achieving the dream bathroom. 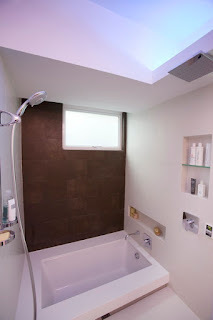 In this bathroom of a Mid-levels apartment, a cosy atmosphere is created through the use of indirect blue lighting. The soft blue lighting creates a muted, spa-like mood. This unique feature is complemented with a minimalist design, which allows stylish décor pieces such as the Nefertiti gold patterned vase from Lane Crawford, the gold candleholders from The Candle Company, and the candle dish from House, a Melbourne brand, to take centre stage. 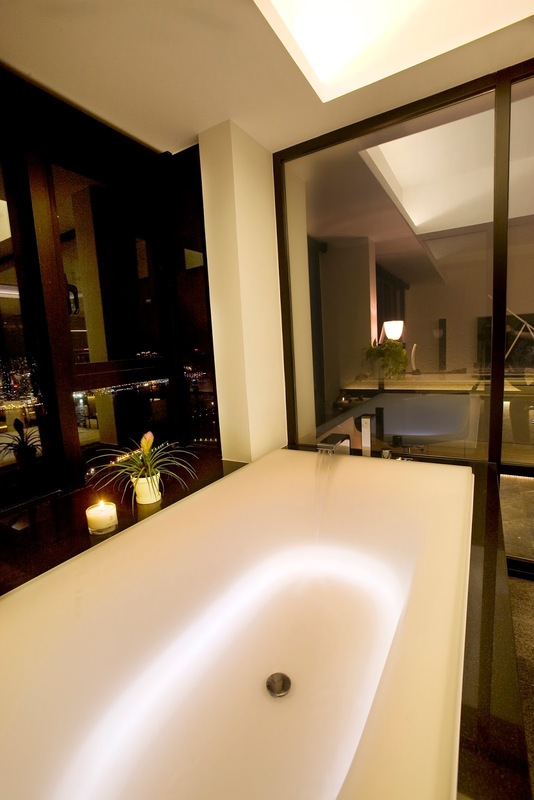 Another highlight of the bathroom is a sunken bath, which doubles up as a showering facility. The owner of this apartment sure has a taste for the finer things in life when he chose to get a flat with stunning views of Victoria Harbour. To ensure the stunning backdrop is not wasted, Clifton used smart glass technology, which allows occupants to be able to see the sea views and the adjoining living room. 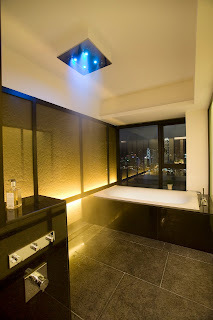 But when the occupants need more privacy, they can switch to a frosted glass mode.The beautiful views are also complemented by a luxurious and relaxing design, which features a rainshower from Gessi that comes with a unique blue LED light feature.